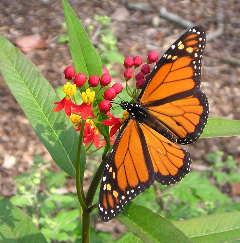 Monarch butterflies are famous for their annual migrations. Some of these insects travel thousands of miles each fall—an astonishing distance for such fragile creatures. Yet few people realize that the Monarchs we see in the spring are not necessarily the same ones that fluttered past in the fall. Beginning in late September, the skies along the Gulf Coast of Texas slowly become filled with meandering groups of Monarchs. Their flight, while not hurried, is purposeful, moving southwest toward a small forest in the highlands of Central Mexico. These butterflies travel from southern Canada and the northern United States at a rate of approximately 50 miles per day ... Read the entire article.